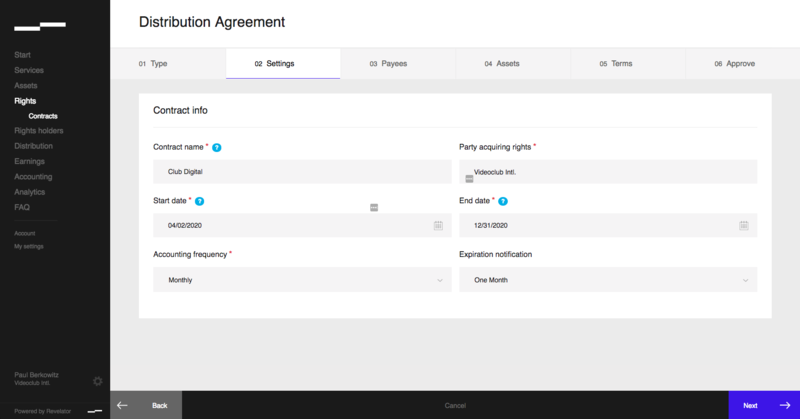 When creating a new contract or editing an existing contract under Rights, the second tab that appears is basic settings. All fields may be edited at any time except for the party acquiring rights. Contract name: Name the contract so that it can be organized and found easily. Party acquiring rights: This is the name of the persons or entity purchasing the rights to the assets in this agreement. Note: The name of the party acquiring rights will be the name of the primary account holder by default. Once the contract has been saved, the party acquiring rights may not be changed. Start date: The acquiring party will be entitled to the assets starting on this date. End date: The acquiring party will be entitled to the assets until this date. To select "In perpetuity" as your end date, enter December 31st, 2099. Click Next at the bottom of the screen to confirm your selections and move to the next page.